The holiday season equals parties. Lots of parties. Whether it’s an intimate dinner party or a neighborhood-wide blowout, the last thing you’ll want to worry about is the entertainment. You’ve got your hands full with food prep and cocktail duty so let your tech do the merry-making for you with these party-friendly products from Logitech. What’s a holiday party without some Santa Baby and All I Want For Christmas (thanks Mariah)? 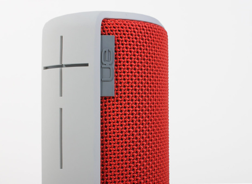 While most of us lack the musical skills and square footage to gather round a grand piano, the UE BOOM can deliver room filling sound for us non-carolers. With 360-degree sound and wireless Bluetooth paring, take turns sharing music and playing DJ with your friends and family. Big party? Pair another UE BOOM for an even fuller, bolder, and more immersive sound. 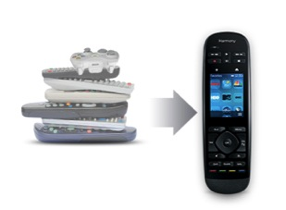 It’s a common scenario: The party’s going great, but someone wants to switch a program on the TV or adjust the volume of the music, only to be stuck with five remotes and no idea which to choose and how to use them. With Logitech Harmony Ultimate , your entire home theater is set in one hand, with the capability to caontrol up to 15 devices with one touch. While it’s tempting to boast, “I have the power!” when using it at the party — it may weird out your guests in the process. For those family and friends who can’t make it to holiday gatherings, it’s now easier than ever to stay connected with a video chat from your TV. Take advantage of a full house by calling your distant loved ones from the comfort of your living room. The Logitech TV Cam HD sits snugly on top of your HDTV and only requires a HDMI port and an Internet connection. With Skype built in and a wide-angle lens, you and your fellow party guests can take turns sending their holiday greetings over a clear connection and high-definition video. The holidays are stressful enough; entertaining loved ones should be the silver lining of the season. Simplify your party planning with these helpful additions from Logitech and save your time for actual schmoozing and socializing. Have any hosting tips for festive gatherings? Share them with us in the comments!